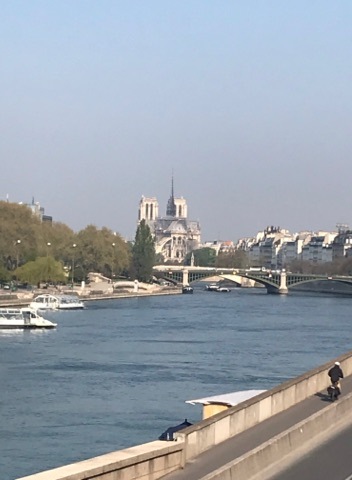 As I prepare to go to bed tonight, flames are still shooting from the top of Notre Dame. The spire has collapsed and the roof of the nave has fallen in. On Friday, as I walked from our hotel to the train station, I crossed a bridge and saw the beautiful cathedral. I took a picture. It was the last picture I took in Paris. I can't believe that it will never be the same. While Earl and I were spending a few days in Paris, we found ourselves strolling around Notre Dame several times. I asked Earl if he had been inside and was surprised to find that he hadn't. I've even attended Mass at Notre Dame. We stopped to look at the bells displayed in a line outside. New ones were purchased to replace these in celebration of the 850th anniversary. 850 years! I can't even fathom something that old. Our country won't be 800 years old until 2576. Me trying to coyly pose along with crowds of other people in front of Notre Dame. You can see the scaffolding around the church where they were working on it. I hope that they find the fire was caused by a mistake in the work going on rather than an act of terrorism. At the same time, I try to imagine a worker with a power tool in hand who started a fire that destroyed an iconic building. That just seems too mundane. Last year, as I reviewed some of the best things we had done in France, I included two visits to Carrières de Lumières and L'Atelier des Lumières, huge art installations that projected artwork onto walls and played music to go along with art. One was near Nimes in the South of France and the other in Paris. You can read my blog posts about them here and here. When I learned that the exhibit this year would be Van Gogh, I had to go. Since Earl was flying out of Paris, we made a mini-vacation out of it with two nights in Paris. I bought the tickets for the art show ahead of time, which was a wise choice because the tickets were sold out when we arrived in line. We went for the earliest show at 10 a.m. People seemed anxious about getting in, but there really was no rush because you can stay as long as you want, and there are plenty of places to watch the show. We got in quite early and I had told Earl that I had been there before and didn't like the view from the balcony. As we perched on a round wooden seat, a guard came by and told us the best view was from the balcony, and there were comfortable seats. We decided to move to the balcony, but I should have listened to my own advice. We could get some panoramic pictures from up high, but watching from the balcony was kind of removed from being down on the floor in the midst of the color, feeling the images move around me and getting a bit dizzy, as if the colors really were washing over me. One of the special things about the exhibit is that the creators find motion in the pictures and add that to the artwork. I tried to record a few short videos that show the motion. After the Van Gogh, there was a Japanese Dream exhibit. I captured part of that from the floor, which is where I recommend you plant yourself if you make it to the exhibit. These look 3D, don't they? Earl enjoyed the show, but admitted he preferred the giant limestone cave where the exhibit takes place in the South of France. Perhaps we'll get a chance to see it there again if we have any visitors this year. Well worth the cost of 14.90 Euros for the ticket. Go if you can. Even when we think we're starting to put down roots, we end up moving -- again. Our beautiful apartment two miles from Quillan just didn't have the internet strength for my teaching job. Someone explained to me that rural areas don't have the internet strengths of towns, even small towns like Quillan. And we found that out. The owners were lovely, having an expert come in. Putting in a DSL cord that I could plug directly into my computer. But no matter what we tried, my classes kept dropping. Then we would do a mad dash into town to mouch off of other people's wifi. After losing six classes, I just planned on never teaching at our apartment. It was stressful. I would move all of my teaching tools, along with my computer to friends' homes. I would worry about the lighting and then my computer began to be picky about the outlets where it was plugged in. I got a 5-star review from one parent who said that her child enjoyed my class but my entire focus wasn't on teaching. And this was true. I was too busy worrying about internet and battery life and things that shouldn't come into my one-on-one teaching time. So Earl and I looked for another place to move. An apartment in town that we had considered earlier still was not completed. The British man renovating it swore that it could be ready in two weeks, but Earl would be gone then and we weren't sure if it would actually be ready. We rented a place along the river for a month. We have a strict deadline to be out though because it is rented to someone else on May 5th. So once again, we found ourselves gathering all of our belongings we had spread throughout the apartment -- emptying drawers, pulling olive oil and spices from cabinet shelves, washing sheets and towels we had acquired, folding the quilt I'd brought from home, . We piled our suitcases and bags near the door, ready to hand out to the street when Earl pulled up the car. We had quite a bit more than we did January 2018 when we left the States with two suitcases and a carry-on bag each. A lot of what is in the bags is cooking supplies and toiletries that we know we'll use, but it is a surprise that we have begun to accumulate goods again, after having purged ourselves of nearly everything a year ago. Still, I have to think that Marie Kondo would be quite satisfied with the scarcity of our belongings. Earl made two trips while I settled down to teach in our new apartment. And this time, in the lovely apartment along the river, we haven't bothered to unpack, Earl shifted things around to the bag he is taking home to the States. I put some of my most commonly worn clothes in a drawer, but the other bags will remain packed in anticipation of another move in less than a month. Why aren't you looking to buy, an Australian acquaintance asked us recently, and I didn't have a good answer. Was I still on the fence about France, about Quillan? Being a nomad is not easy, so some tough decisions must be faced in the coming days, and we'll make them while Earl is in the States and I am in France. Will the apartment be ready and will we want to move there? Will we opt for something totally different in a new part of France? Will we chuck it all in and return to the States during the high tourist season, coming back to France in the fall? But then we would miss all of the musics and the festivals. Stay tuned to see where we land. Wherever it is, we know it will be an adventure. If you follow me on Facebook, you've already seen part of this story but I thought I'd dive a bit deeper on the blog. On Saturday morning, Earl told me he heard a horrible screech during the night and when he went out on the balcony, he saw a bird dangling in a tree. Our neighbor Jack had seen the same thing and they determined it was an owl. The bird was upside down on a tree branch and just looked like a mess of feathers. We all agreed that it was sad and wondered how it had managed to hang on. Theresa, who has worked with raptors at the zoo, wondered if it might have fallen prey to people who put tar on branches to catch birds, but the branch was over the river and not reachable by people except from our terraces. Theresa came back to look at the bird and none of us saw any movement, so we agreed the owl was probably dead. We felt sad about it and wondered if the blustery night had doomed the bird. Later that evening, Jack messaged that we should look at the bird. It was upright on the branch, one wing weirdly stuck out. From this angle, you can hardly tell that he's hurt. It must have broken a wing, I suggested. I decided to call the "pompiers" which is French for firefighters. They have been known to rescue wil animals and get them where they need to go. I didn't know the number to call for the pompiers' non emergency and I still hate speaking French on the phone, so I drove out to their station. Several firefighters stood around a truck and they looked at me curiously as I pulled up and walked toward them. I had a picture of the owl and some basic phrases I planned to use. A young woman firefighter came toward me and I told her about the owl with the broken wing. I didn't look up the word for wing, but I could hold my arm up awkwardly so she knew what I meant. She informed me that I needed to call 18 so they could be dispatched. I hemmed and hawed, trying to get out of making the phone call, sure that I wouldn't be able to explain it adequately. But I drove back home and used Earl's French phone to call. I told the man on the line that there was an injured owl in a tree over the river. He asked me some questions like what city I am in and how high is the branch. I could answer those. Then he asked me, how do you know it is injured (blessé)? I didn't expect him to challenge my assessment of the bird. I explained that this morning we thought it was dead. I couldn't think of the word for upside down so I quickly looked it up and said, "ce matin nous avons pensé qu'il était mort; c'était à l'envers." And then I explained that it was no longer "à l'envers." The man told me, Don't worry -- "Ne t'inquiète pas. C'est normal." It's normal for an owl to be in a tree. Did he think because I don't speak fluent French that I was stupid, that because I couldn't explain in French how the bird was injured that it couldn't be injured? Possible. Unfortunately, I speak better French than many English speakers here, so it frustrated me terribly that they didn't take me seriously. I posted on Facebook, hoping someone from the town would see it and come to our rescue, and someone did, but not the pompiers. Instead, some British friends who are animal lovers kept asking if the bird had been saved yet. I figured I hadn't been clear enough in my writing that the firefighters were not coming to save the bird. As darkness began to descend about 8 p.m., Steve and Lou pulled up in their van. We debated the pros and cons of trying to save the owl. After all, it had come back from the near dead, and it looked better, being upright instead of upside down. Maybe if we left it alone it would heal. It might try to attack us if we got close to it. What if we tried to save it and knocked it into the river. Lou was ready to jump in after the owl, she decided as she stacked her phone on a stone and Steve added his to the pile. Steve had been a firefighter in England, and he's in great shape, running and biking constantly. Two tree trunks run parallel, so Steve shimmied up the one opposite the owl's perch. Once he got close, he could see that the bird was wrapped in fishing line. Oh no. I felt so guilty then for not trying to go up and check on it earlier. The poor bird had been tied to a tree branch all day. As Steve assessed the situation, he decided the best way was to cut through the two branches, the one where the bird sat and the other where its wing was attached by fishing line. We found a saw and Earl climbed a bit up the trunk to hand it to Steve. Then he began to cut through the wood. As the branch cracked, we feared that the bird and the branches would plunge into the river. But Steve stopped and reached over to break off the two branches together. He handed them to Earl, who somehow handed them to me. He had lost his grip on the branch and dangled by his injured wing, so I quickly tried to get his feet to the ground so I wouldn't put more stress on his injured wing. Earl squatted down with a pair of scissors and began to snip away at the fishing line. Lou put a towel over the owl's head, but he had remained calm throughout, not squawking or snapping. Earl removed the fishing lure attached to the line. The hook wasn't embedded, just caught in the feathers. And slowly, unwound all the fishing line as Steve and I held our phone lights over the whole procedure. Finally, the owl was free, but he made no move to flea. Lou suspected he would be weak and dehydrated after a day wrapped in fishing line. She decided to take him home and to try to find someone to look after him on Sunday. So with him wrapped in a towel, we came into the light and I finally got a shot of him, his eyes closed, swaddled in Lou's arms. The latest report is that he's taking some water through a dropper, but not eating the proffered dog food. Theresa suggested the dog food should be soaked in water so the owl could get hydrated. She told me they used to soak dead mice in water before they fed the owls, but none of us had dead mice. They tired reaching out to people today, and our French friend Cedric even made some phone calls to try to reach the wild bird people, but we've had no luck. Hopefully, he'll continue to heal and a vet will take him on Monday. But the language thing still bothers me. I wasn't able to convey the seriousness of the matter to the pompiers, and I wonder how many times things are shrugged off because the person who is calling doesn't speak the language. I know it doesn't only happen in France. I'm sure the same thing is true in the States for people who don't speak English. I wanted to return to the fire station today with pictures and explain how we saved the owl and how the dispatcher told me not to worry that owls are supposed to be in trees, but I restrained myself. Hopefully, if I ever have a people emergency, I'll be able to make myself understood. Meanwhile, I better keep working on my French. Now what was the word for wing again? We've all read news stories about a business going under and wondered what happened to the people who had tickets for the cruise or the flight, but Earl and I had never faced that ourselves -- until this week. Earl was scheduled to fly back to the States next month on Wow Air. That's the cheap airline that lands in Iceland, and they went belly-up on Thursday, leaving him holding useless tickets. We hadn't heard about Wow Air until our friend Najah flew over last year. She drove from Columbus to Pittsburgh and flew Pittsburgh to Reykjavik to Paris. When Earl needed to go home quickly last August (the height of airfare costs from Europe to the States) he flew Wow. Then when I rushed home in February, going one way, the cost was cheapest again on Wow. I returned on Norwegian, another low cost airfare. Our experiences were fine, although, at one point when they announced, is there a doctor on board, I thought, "Really, would a doctor fly Wow Air?" Unlike most airlines, Wow did not have in-seat entertainment. Maybe it seems spoiled to want to have movie and TV choices on an 8 or 9-hour flight, but it sure does make the flights go faster. When we learned on Thursday about the death of Wow Air, we wondered if we should have been more aware. I had seen an article with the headline like "Why It's Safe to Fly on Wow Air" and I tried to click on it but I was blocked because I didn't have a subscription to The Guardian. That just made me think, huh, I wonder if we shouldn't be flying on Wow. There was some muttering about financing, but other articles assured that the funding always comes through at the end through Iceland. So we obliviously scheduled a flight on Wow. When we saw through our online news that the company had gone under, we regretted not buying the flight insurance. Then we hopped on and rearranged another flight for Earl. We figured that everyone would be looking for replacement flights. On Travelocity, we found a flight that was even cheaper than the Wow Air flight. So we booked it (he will have to pay for checked luggage since he's taking his backpack home for a hiking trip) but we felt fortunate to be able to schedule so last minute for $631 (561 euros). Then we had to worry about how to get our money back. CNN told us we were basically screwed. We could file with the company but we would become one of many creditors asking for our money back. Another article suggested that credit card companies might have been keep track of the shaky finances of the airline and have held back money instead of paying upfront. Earl contacted our credit card company the next day and they said the money would be refunded within 7 days! What a relief, and a reminder that using the right credit card company is important. So no more WOW, but I'm convinced that we'll be better off choosing a specific airline and flying with them every time to earn points. And will we be using that credit card again? Yep, whenever we book travel, count on us using our Sapphire card. When I returned from the States, I was determined to be in the moment wherever I am. Last year, I felt like I longed for the States when I was in France and longed for France when I was in the States. I needed to make the most of wherever I am living because I could become one of those perpetually unhappy people, always wanting the grass on the other side of the fence. So I was eager to reconnect with all of our friends in France. I set up coffee dates, dinner dates and even decided to hold a game night at our new apartment. Add to that my teaching 4 hours a day on weekdays and 7-8 hours on the weekends, and my time in France has flown past. Our new apartment is 1.9 miles from the town where we planned to live. Like an episode of House Hunters International, we couldn't find a house or apartment that offered everything we wanted. We had to compromise. We could have the apartment in the town that didn't offer any outdoor space, but had a nice open living/dining room and remodeled kitchen. The toilet situation wasn't ideal either because the toilet faced the door and it was so tight, I wasn't sure that someone with long legs could sit on the toilet and close the door. 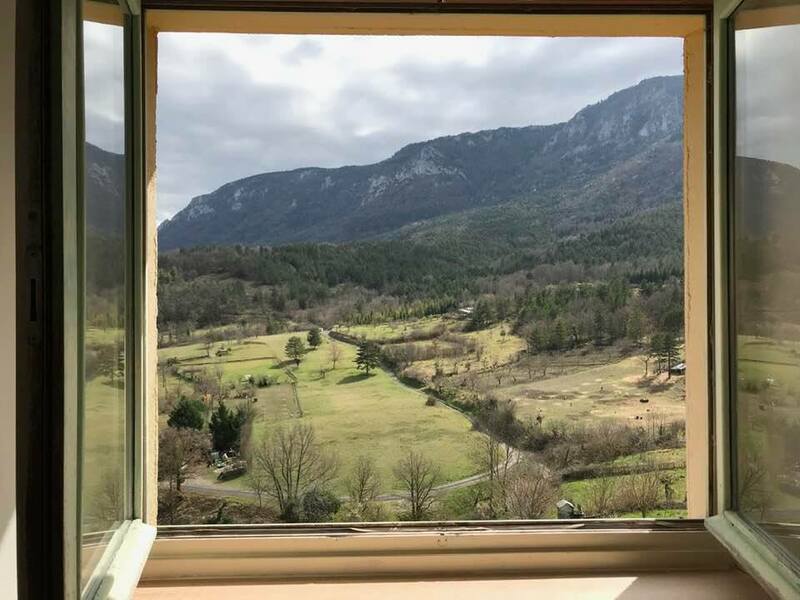 Outside Quillan, up a steep hill that I used to run toward, was an apartment that the owner was just finishing with a new kitchen and bathroom. Two bedrooms, a great view, and some outdoor space. We decided to take the place farther out of town, figuring that by the end of the year, we'd be in great shape by climbing up to our apartment. So the first test of commuting to town à pieds came Friday evening, after I had arrived Thursday, we made plans to meet our French friends for dinner in Quillan. We walked. The sun was just setting as we traipsed down the switchback roads and into town. We realized as we went that we were both wearing black, not the best color to be seen by passing cars as we later would walk home in the dark on the winding road. The walk took longer than we anticipated, so we arrived late (en retard) and as we exchanged cheek kisses, they remarked on our cold cheeks, so we revealed that we had walked down from our new home. They were amazed and insisted on driving us back up the hills after our dinner. It was too dangerous to walk on the winding road at night, insisted the former police officer. We ate at a crêpe place, and we practiced our French as our friends practiced their English. The only picture I got from our evening out was when one of the restaurant cats wandered through. He was a huge cat, and when Cedric got up to pay, the cat jumped up in his seat as if it was his rightful place at the table. The cat rubbed himself against anything hanging off people's chairs. No one seemed bothered. Everyone has heard how difficult it is to make friends with French people. We lucked into Cedric and Valèrie. He was working as a bartender in a local bar and enjoyed speaking English and telling us about his adventures in the States. Luckily for us, they love the U.S. They were even married in Las Vegas. Valerie doesn't speak very much English but she is trying to learn, so we hope to start meeting and practicing English for her and French for me. As they dropped at us our new apartment, we invited them in to take a look. Valèrie, who has a certain sense of aesthetic (like most French women) gave a nod of approval to the decorations of the apartment with its bold black and white tiles in the kitchen and the open room that gives way to a view of the mountains, but on that night, we could only see the nearly full moon and the outline of the mountains. Before they left, Cedric invited us to their home in a village about 15 minutes away. They were having a barbecue the next afternoon for their neighbors. The barbecue started at noon, but, unfortunately, I taught until 3. Come after, he insisted. The soiree would still be going on. So after meeting friends for coffee the next morning during the Saturday market, I taught until 3 and we texted Cedric. Yes, we should come, he said. With our bottle of red wine in hand, we followed the GPS and pulled up to a table outdoors in the sun with several French people sitting around it. Cedric and Valerie made introductions and then gave us a tour of the house they are redoing. They've done a lot of work and are turning it into their dream house. How to describe this gathering of French people? They were all very accepting of us. They shared some great stories, and I got into a discussion that was beyond my French abilities as I tried to describe the differences between Americans' freedom to and the French freedom from. Well, I'm not doing a very good job describing it in English either, but basically it's about the French security net. The entire outing was all very jovial as they counted how many bottles of wine they had drunk since they began at noon, and we realized that when going to a French person's house, perhaps two bottles of wine should be the gift. There were discussions about whether I looked more Mediterranean or Latin, which made me laugh since I have frequently been mistaken for Irish. It must be my wild, curly hair. The only hitch was the the woman who got sick because she drank too much wine, although her husband claimed it was because of the sun. Our hostess ended up having to clean up the bathroom afterward, and then when the woman later got sick outside, she cleaned that too. I had my hackles up, thinking the woman should have gone home to her house -- only two houses down. After another French couple excused themselves, I reminded Earl that we needed to stop by the grocery before it closed at 7, so we exited with me driving. After we had dinner, we drove down to Quillan where a brew pub had blues music playing. We ran into more acquaintances there and were invited to join them. They had all the inside dirt on the inebriated French woman who was ordering everyone to stop talking so they could focus on the music. To hear our friends tell it, she'd been thrown out of every bar in town except this one, and she had a famous parting line when she got ejected from a nearby bar, but I won't share it with you because I'm sure I'll be able to use it in a novel someday and you'll think I'm awfully clever rather than simply quoting someone. On the weekends, I teach a lot, starting at 7 (or 6 when I get the time change wrong) and going to 3 or 4, so I've been trying to schedule some down time during midmorning to enjoy my French life. Sunday mornings there is a market at Esperaza, a nearby artsy town. I meant to schedule 9-11 off work, but got 8-10. France hasn't sprung forward with their clocks yet, so that messed up my calculations. We were too early to meet with friends but wandered into the market anyway, buying a new scarf to replace the one I lost in the States, and a blue one for Deb, because she always tries to steal her husband's. We got vienoisseries (breakfast pastries) at the bakery and took them to the nearby cafe for coffee and pastries. There we ran into some acquaintances we'd met the year before. We ended up chatting for quite a while and exchanged numbers so we could get together. But even before we ended our chat with the new friends, some other friends showed up and we wandered through the market catching up. It's just a pleasant surprise to find people I enjoy socializing with at every turn -- not that there weren't wonderful people in the States, but I guess we didn't have as much time to socialize because we were running to kids' events or had to get decent sleep before going to work the next day. By the end of the weekend, I felt sated with socializing, but that gave me time to gear up for game night. We made a go of it with one American couple and two British couples, so eight total and lots of food, drink and conversation. My team did not excel at the games, but it was great to have everyone at our new place, which isn't so bad, once you duck to get in the door. I think I've kept my end of the bargain, promising to live in the moment, as I continue to meet with friends, making new connections and renewing old ones. I recently saw an article about how it is difficult for women over 50 to make new friends. I recommend moving to a new country and not being shy about showing up for quiz night and market days and town dinners. It certainly has grown my social circle. When I discovered the inexpensive flight from Tampa to London, it felt like Christmas morning. A direct flight from Tampa to London for $175 (153 Euros). I splurged on the upgrade so that I could take a checked bag, pick a seat and get two meals on the plane for about $250. Still, an amazing price on Norwegian Air. I visited Mom and Dad, and they are about an hour and a half from either Tampa or Orlando. The dilemma was that I flew in on Friday afternoon and took off in a rental car at 4 p.m. The car was already expensive and I didn't dare splurge on late check in, so I had to be back at the airport by 4 p.m. The problem? My flight didn't leave until 10:50 p.m. So I was looking at a 6-hour wait at Tampa. For my carry-on bag, I had switched to Earl's backpack because he hopes to go hiking when he flies back to the States next month. The backpack has no wheels and is a bit unwieldy, especially since it is made to fit a man who is a foot taller than me. But it weighed only 30 pounds, rather than the 40 pounds I was allowed to check. Once I got it onto my back, I was fine to walk from the car to the terminal. The problem, this flight to London was the only flight out of Tampa for Norwegian that day. The check in didn't open until after 6, which left me holding the bag. I couldn't check the backpack and wander about the airport, smelling perfume and sipping coffee. I'm not sure if I'd flown another, more traditional airline, like American, whether I could have checked my bags six hours early or if they would have made me wait until closer to the flight time. Nevertheless, I ended up sitting in a row of seats across from the counter waiting. Norwegian also didn't allow online check in, so I if I hadn't checked a bag, I still would have needed to wait to get my boarding pass from the desk. I met a few other people waiting for Norwegian to open. At one point, I needed to use the bathroom and didn't want to carry the backpack along with my carry-on bag. The nice British man had dozed off, so I asked a woman who was waiting for Norwegian if she would watch my backpack while I went to the restroom. The door was within sight, I wasn't making a run across the airport, but the woman refused. Perhaps that's the smart thing to do, but the exchange woke up the British man who said he would watch my bag. And later, I watched his while he went to the bathroom. I reached someone on the Norwegian app and they said that the check in would open three hours before the flight. Once the check in began, apparently, people in line strategically pick which counter attendant they want to talk to. I was oblivious, in my own American way, assuming everyone would be equally helpful. So I got the very gruff man who took the backpack, no problem, then said I had to weigh both my carry-on bag and my personal item and they had to way less than 10 kilograms. 10 kilograms is 22 pounds. I knew that my carry-on suitcase alone was 25 pounds, which is a normal allowance. Add my purse, which held my computer and the total weight was 18 kilograms, 39 pounds. The attendant suggested I could pay $15 per kilogram that the bag was overweight. Eight kilograms times $15 is $120. I was not going to eat that cost. I always feel like the weight thing is unfair. My husband weighs nearly a hundred pounds more than me -- shouldn't I get to take extra baggage to make up for the weight I'm not using. Anyway, I asked whether I could move things from my carry-on to my checked bag, since it was underweight. The man agreed and wanted me to do it while I stood in line. That's the worst. Now I have to open my suitcase and start making decisions. I moved a folder of papers (paper generally gets heavy) that I use for teaching, and I stuck a pair of boots on the top of the backpack. Then I struggled to get the backpack closed again. The attendant ended up helping me and didn't weight the bags again. But just in case he planned to, I had taken my computer out and set it on the floor in front of the check in. I figured that would help with the weight issue and then I would surreptitiously slide it into my purse again after the weighing. Instead, he waved me on and I scooped up my laptop. So let the luggage thing be a warning to you if you plan to try Norwegian Air -- the carry-on for the overhead bins, and the personal item that goes under the seat in front of me had to weight less than 22 pound together. I finally could move on to take the shuttle to the gate. The security guards were testy. I overhead them discussing whether overtime would be given. The TSA Pre check area wasn't open, much to the consternation of some pre-screened passengers. I went through the machine and they patted down my arm. Then I found that my carry-on bag needed to be checked by hand. The guard (this one was nice) gingerly moved things around in the suitcase, plunging his hand down between the (luckily) clean clothes. "There's an umbrella down there," I said. "No, I can see the umbrella. This is something like a bag of candy." "Black jelly beans!" I said. Earl's favorite. I had stashed a bag in my suitcase. "Yes! Where are they?" He explained that jelly beans are dense and hard to see through on an x-ray machine. I reached in and got them. He took a cloth and rubbed it again several spots on the jelly bean bag. "It tested positive," he said and set off an alarm that brought another agent. "Positive for what?" I asked, imagining that jelly beans were about to send me to the Homeland Security secret office where I wouldn't be heard from for weeks. The security guard assured me that it could be lotion, or anything that set it off. Another guard arrived, looked at a machine and declared it "Not a match." Ok, I was allowed to go on my way. "Want me to lift the bag down for you?" the guard asked. "It's pretty heavy." "Shh," I warned him. "Don't let on that it's heavy." Finally, I was free to wander about the airport terminal until it was time to board the plane. But I got a coffee at Starbucks, my last until the holidays next year, and I sat down to watch another episode of the Great British Baking Show. The flight from Tampa to London was uneventful, which is the best you can ask for from a flight. I am never crunched for space because I'm short, but I did feel like there is less leg room. My husband would have had a very hard time in theses seats. And the airplane did have screens with movies, television and games, but I have to say that they weren't as up-to-date as we might see on a mainstream airline. And the food wasn't worth the time. Nope. Not even the Ghiradelli chocolate in the cup got eaten. Chicken, mushy broccoli along with instant mashed potatoes for dinner. It was after 11. I shouldn't have taken the few bites I ate, but since it was Norwegian, maybe I should just be grateful they weren't serving smoked trout or Tørrfisk. The next morning, breakfast was a piece of ham sandwich. Just ham bread and some wilted lettuce, along with a pre-wrapped Sara Lee pound cake that is in our kitchen now. The coffee and orange juice were necessary though. So my recommendation, if you fly Norwegian, watch the weight of your carry-on and under seat bag. Don't buy the meals. I landed in London Gatwick airport with three hours to kill before my flight to Toulouse. I wandered around in search of a crumpet. I never found any. Crumpets are similar to English muffins but better. The Brits I asked were astounded that we didn't have crumpets in the States. We're deprived, I guess. A man in a kilt -- always worth a picture. Yes, those are two bottles of liquor in his hands. The flight from London to Toulouse was only an hour and 20 minutes, and when I wandered through security, there was my husband waiting with a bouquet of tulips. Unfortunately, I couldn't tilt my head back to kiss him because his backpack against my neck prevented me looking up, so it was an awkward hello kiss. We're back in the groove of spending time together and enjoying it. Since I returned (only three days ago) we've had adventures already. Can't wait to share them with you -- soon.